How to recite the blessing ברכה before and after the Torah reading. Thank you to our onscreen talent: Reader-Jim Sherman; Gabbayim-Scott Gordon and Joel Mintzer; Aliyah-Allie Greenstein and our musicians: Clarinet- Alexander Fiterstein; Piano-Timothy Lovelace. ​Begin or end your day with ​prayer and community. Be a voice in our rich spiritual life here at Adath. 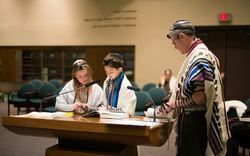 We invite you to start your mornings off with intention, prayer and community during our minyan. As a cornerstone of daily Jewish practice, davening in a minyan speaks to the vitality and rich spiritual life here at Adath. It binds us as a religious community and provides comfort and community support for those who are mourning or observing a yahrzeit. Join us in strengthening our kehillah (community) by committing to one minyan a month! If you are interested in leading minyan, watch for our upcoming class on Sunday mornings after our 9:30 AM minyan. To learn more, contact Hazzan Joanna Dulkin at hazzandulkin@adath.net. How to recite the blessing for lifting הגבהה and tying גלילה the Torah. Reader- Jim Sherman; Gabbayim- Scott Gordon and Joel Mintzer; Lifter (Magbiya)- Avi Baron; Tyer (Golelet)- Hannah G.
If you need a ride to or from Adath services or synagogue events, our volunteers can help you stay connected to our Adath community. For transportation, call Adath’s Yad Sima Tova Transportation Hotline 952.215.3937. Please make arrangements at least five days in advance.